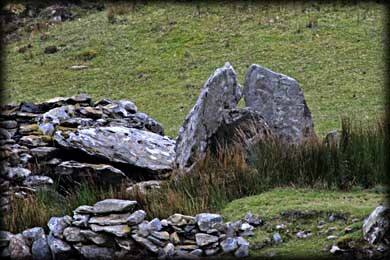 While we could clearly see this portal tomb from the road, access from that approach would have been quite tricky since it lay across a stream and behind a fence. We were running out of time as the light was fading so chose to take these images from the road. 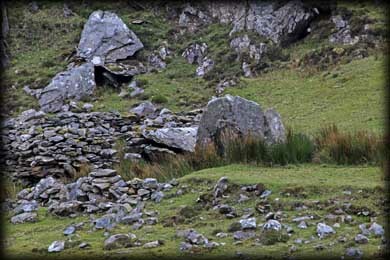 The best way to approach the tomb is probably from the farmhouse further west of here. We could see two tall portal stones with a door-stone between them. To the west was a large flat stone that may be the misplaced cap-stone. The megalith is sitting on a small man made platform. Situated: From Rinvyle head head west 800 metres turn left. 1.4 metres south turn sharp right. The tomb is 1.3 metres down here on the right across the river.